Below you’ll find a brief overview of what you can eat. Scroll further down to see more details on each section. Fats will be the majority of your daily calorie intake when you are on a ketogenic diet, so choices should be made with your likes and dislikes in mind. They can be combined in many different ways to add to your meals – sauces, dressings, or just simply topping off a piece of meat with butter. You also want to have a balance between your omega 3’s and omega 6’s, so eating things like wild salmon, tuna, trout, and shellfish can help provide a balanced diet of Omega-3’s. If you don’t like fish, or just prefer not to eat it, we suggest taking a small fish oil supplement. You can also take krill oil for omega 3’s if you are allergic. Below, you’ll find a visual list of proteins that are commonly consumed on a ketogenic diet. Note that the higher the amount of protein, the less you will want to consume. Your best bet when it comes to protein is choosing pasture-raised and grass-fed. This will minimize your bacteria and steroid hormone intake. Try to choose the darker meat where possible with poultry, as it is much fattier than white meat. Eating fatty fish is a great way to get omega 3’s in as well. When it comes to red meat, there’s not too much to avoid. Cured meats and sausages can sometimes have added sugars and added processed ingredients. If you eat steak, try to choose fattier cuts like ribeye. If you like hamburger meat (ground beef), try to choose fattier ratios like 85/15 or 80/20 in some cases. Try to balance out the protein in your meals with fattier side dishes and sauces. If you choose to eat lean beef, you have to be especially careful with the portioning of protein. Jerky and other beef snacks can add up in protein very fast, so make sure to pair it with something fatty – like cheese! Note: If you don’t eat pork or beef, you can always substitute lamb in its place since it is very fatty. Replace cuts of meat like bacon with similar, leaner items. Add extra fat if needed. 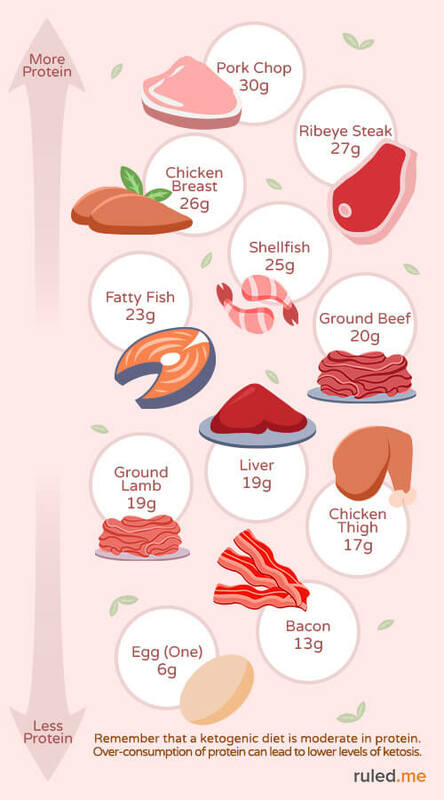 Here’s a nutritional list of some of the most commonly consumed proteins on keto and their respective nutritional profile. Keep in mind that you still need to balance your protein intake with fat. Below, you’ll find a visual list of fruit and veggies that are commonly consumed on a ketogenic diet. Note that the higher the amount of carbs, the less you will want to consume. Vegetables are a paramount part of a healthy keto diet, but sometimes we’re stuck with decisions we might regret later. Some vegetables are high in sugar and don’t cut it nutritionally – so we need to weed them out. Try to go after cruciferous vegetables that are grown above ground, leafy, and green. If you can opt for organic as there are fewer pesticide residues, but if you can’t then don’t worry. Studies show that organic and non-organic vegetables still have the same nutritional qualities. Both frozen and fresh vegetables are good to eat. Note: Vegetables that grow below ground can still be consumed in moderation – you just have to be careful about the number of carbs that they have. Usually, underground vegetables can be used for flavor (like half an onion for an entire pot of soup) and easily moderated. 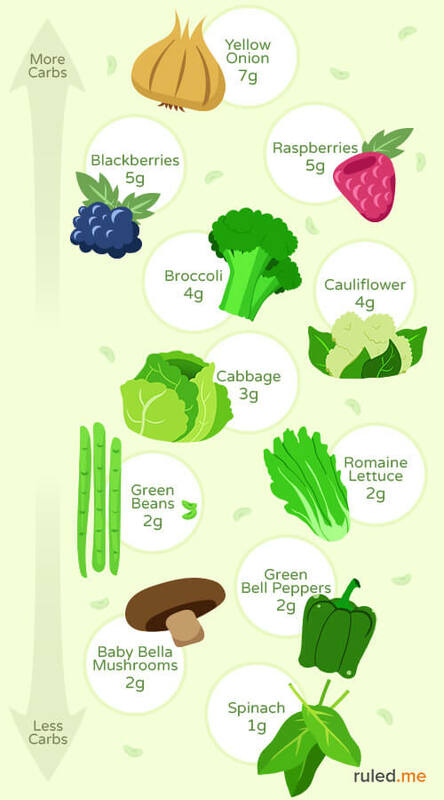 Here’s a nutritional list of some of the more commonly consumed vegetables on keto. Keep in mind that the weights are the same of everything listed so that it will impact the skew of the carb counts. For example, in a meal you may have 6 oz. of broccoli in the side, but you would not have 6 oz. worth of berries in the morning. You may mix 6 oz. of berries into a pudding with 4 servings. Below, you’ll find a visual list of dairy that is commonly consumed on a ketogenic diet. Note that the higher the amount of carbs, the less you will want to consume. Dairy is commonly consumed in tandem with meals on keto. Try to keep your dairy consumption to a moderate level. Most of your meals should be coming from protein, vegetables, and added fats/cooking oils. Below you’ll find a nutritional list of the most commonly consumed dairy items on keto. 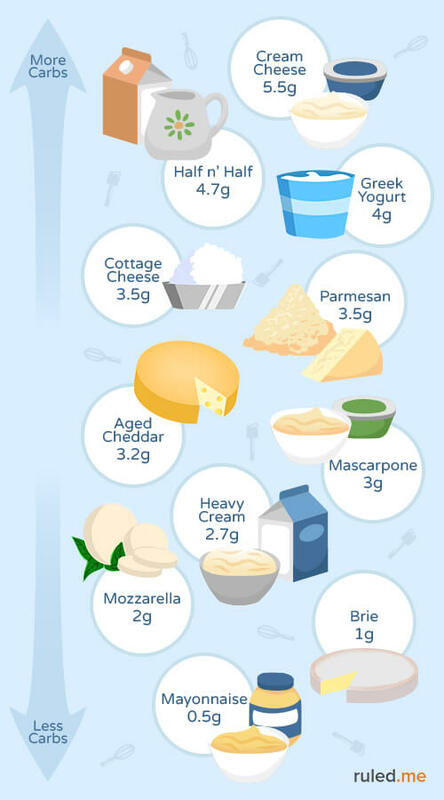 By far the most common dairy items used are heavy cream (for tea/coffee) and cheese (for added fats in meals). Note that the nutrition values in the table are based on 1 oz. servings while the visual guide is based on 100g servings (~1/2 cup). 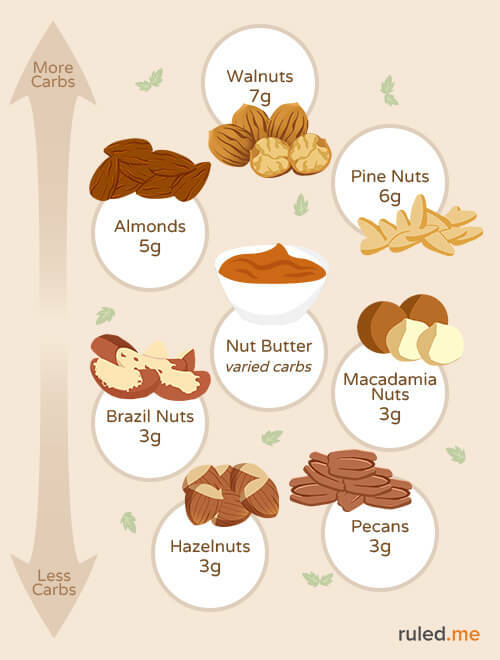 Below, you’ll find a visual list of nuts that are commonly consumed on a ketogenic diet. Note that the higher the amount of carbs, the less you will want to consume. Note: If you have a nut allergy, a common substitution for almond flour is sunflower seed flour. Just keep in mind that this has higher levels of omega 6 fatty acids. 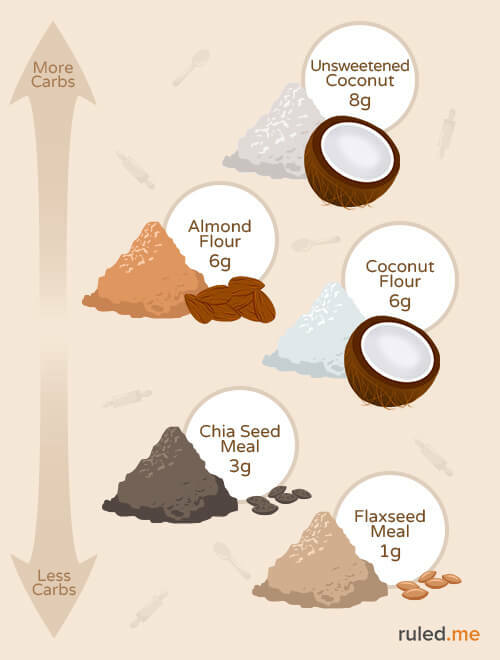 Below, you’ll find a visual list of nut and seed flours that are commonly consumed on a ketogenic diet. Note that the higher the amount of carbs, the less you will want to consume. Nut and seed flours are great to substitute for regular flour. Commonly consumed on keto, seeds and nuts are frequently seen in baked recipes and dessert recipes. We often see the use of nuts (in almond flour) and seeds (in flaxseed meal) but should be eaten in moderation. You can usually use a mix of multiple flours to get a realistic texture in baking recipes. Combining flours and experimenting with your baking can lead to much lower net carb counts in recipes. We think these lemon poppyseed muffins (a mix of almond flour and flaxseed meal) make a great texture when combined with the fats from the heavy cream and butter. Remember that different flours act in different ways as well. For example, you would only need about half the amount of coconut flour as you would almond flour. Coconut flour is much more absorptive and generally, requires more liquid. Besides baking, you can also use these flours as a breading when frying foods or even as a pizza base! 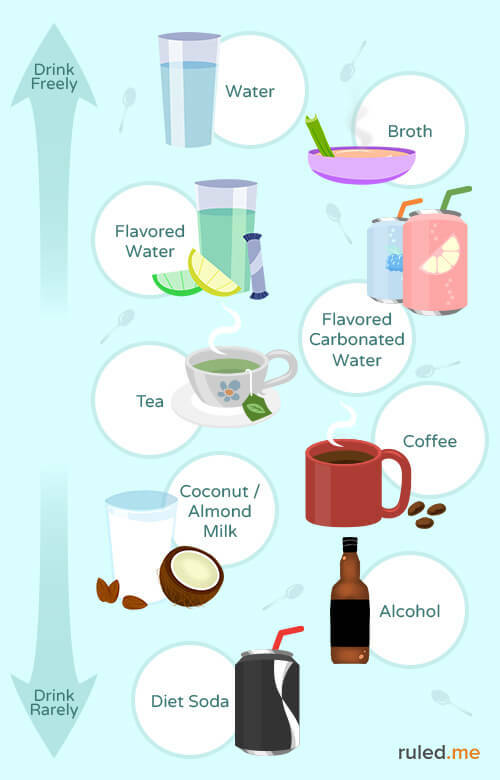 Below, you’ll find a visual list of beverages that are commonly consumed on a ketogenic diet. Note that the more restricted they are, the less you will want to consume. Many people choose ketoproof coffee or tea in the morning to ramp up energy with added fats. While it is a great thing, it’s also important to consume flavored beverages in moderation. This is amplified when it comes to caffeine as too much will lead to weight loss stalls; try to limit yourself to a maximum of 2 cups of caffeinated beverages a day. Note: Many people experience the Keto Flu when transitioning to keto due to dehydration and lack of electrolytes. Make sure that you replenish your electrolytes and drink plenty of fluids. An easy way to do this is by drinking bone broth or sports drinks sweetened with sucralose or stevia. Many people enjoy keeping themselves accountable by creating challenges for themselves. We use a 32 oz. water bottle and put four hair ties around it. Each time we finish a bottle, we take away a hair tie. Keep drinking until there’s no more! Below, you’ll find a visual idea of spices that are commonly consumed on a ketogenic diet. Even small ingredients can add up in carbs; make sure to monitor spices and condiments that you add to your meals. Typically speaking, the number of carbs in spices is minimal, so you don’t have to drive yourself crazy with measuring and recording. When using a lot of spices in a recipe, carbs can add up quickly. Below, you’ll find a visual idea of condiments that are commonly consumed on a ketogenic diet. Sometimes there is a lot of added sugar in just a teaspoon of sauce; double check nutrition labels to make sure it fits into your macros. Sauces, gravies, and condiments, on the whole, have a lot of a gray area on keto. Generally, if you want to be strict, you should avoid all pre-made sauces and condiments unless listed below. They can have added sugars or use sweeteners that aren’t friendly on the ketogenic diet. Try to err on the side of caution when it comes to keto condiments that are pre-made. Make your sauces and gravies using thickeners, and try to make your own condiments where applicable. Always double check the nutrition and ingredient list on your food to make sure that it fits in with your dietary requirements. 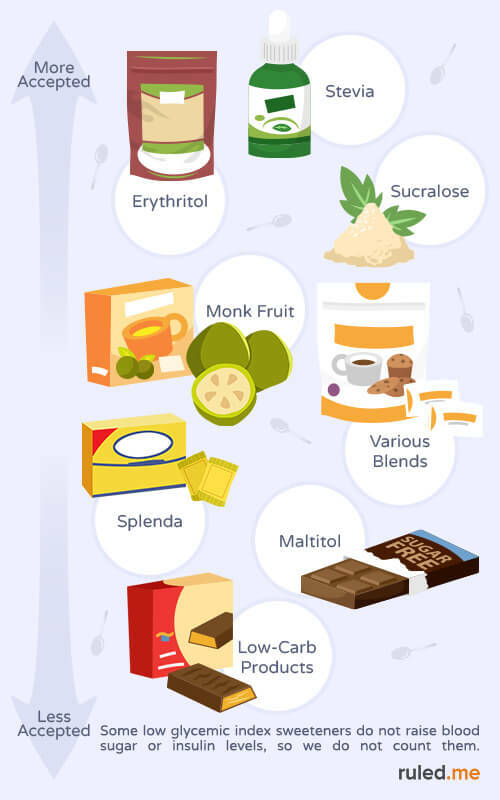 Below, you’ll find a visual list of sweeteners that are commonly consumed on a ketogenic diet. Note that the less accepted they are, the less you will want to consume. Staying away from anything sweet tasting is the best bet – it will help curb your cravings to a minimal level, which essentially promotes success on the ketogenic diet. If you have to have something sweet, though, there are some options available to choose from. When searching for sweeteners, try to go after liquid versions as they don’t have added binders (such as maltodextrin and dextrose). These are commonly found in blends like Splenda and can add up in carbs very, very quickly. For keto, you want to try to stick with lower glycemic index sweeteners. Please note that this is just a small list of sweeteners that people use on keto. There’s tons of different brands and blends out there – we frequently use a mixture of stevia and erythritol in our dessert recipes. You may find something that suits your tastes better, though, just make sure that it is on the acceptable sweetener list. Typically you want to stay away from any brands that use filler ingredients like maltodextrin and dextrose, or high glycemic sweeteners like maltitol. Many low-carb products that claim low net carbs usually use these sugar alcohols. Many candies that are “sugar-free” also use these sweeteners. Avoid them where possible. These specific sweeteners respond in our body in a similar way sugar does. Various blends. There are numerous brands on the market that combine these sweeteners in their ratios. Be careful and read the ingredients. Most of the cravings that we get are caused by sugar. Sugar, at the end of the day, is an industry that’s run on addiction. There have been numerous studies showing that sugar stimulates the reward centers of the brain. When we constantly consume sugar, we release dopamine in our brain – creating an addiction and an increased tolerance. Over time you will have to eat larger and larger amounts of sugar to continue the dopamine secretion. Once our body is dependent on a chemical reaction in the brain, we can find that we’re craving things even when we’re not hungry. Besides sugar, sometimes our bodies crave food because of lack of nutrients. 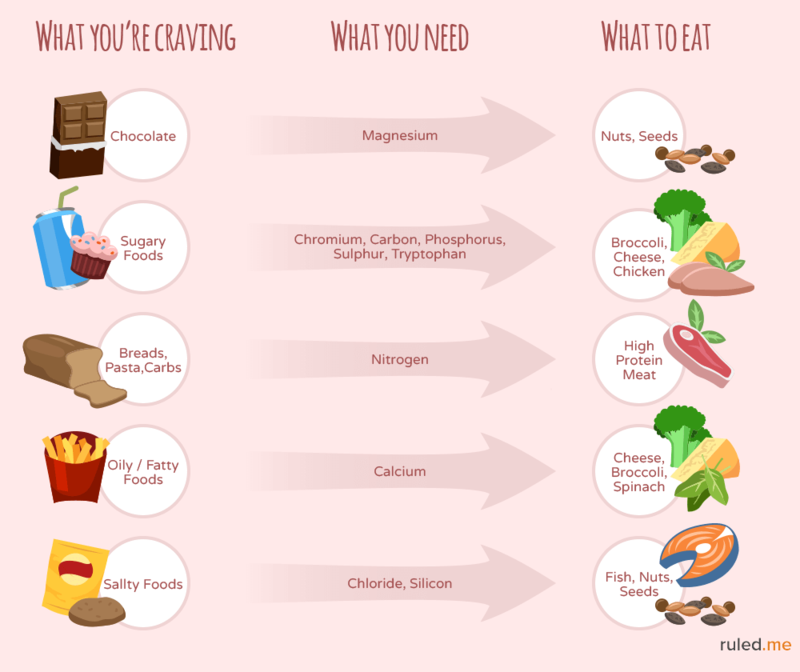 The craving usually goes away if you fulfill your nutrient intake in a different way. Below you’ll see a few ways to get rid of pesky cravings that hit. Going on a ketogenic diet can be very difficult in the very beginning. Knowing what to eat and what not to eat takes some time to get used to, so if you make some mistakes in the beginning don’t be too hard on yourself. It’s better to make a mistake and learn from it than to make a mistake and not realize it was in error. Low-carb products. There’s a lot of choices when it comes to bars, snacks, and foods. It’s better to stay away from these, but if you have no choice make sure to read the label. Many use high glycemic index sweeteners in their products. Spices. As mentioned above, spices do have carbs – but certain ones have more carbs than others. These include onion powder, cinnamon, garlic powder, allspice, and ginger. Always read labels and make sure no added sugar are in your spice blends. Fruit and berries. Most fruits are not allowed to be consumed due to the high sugar content. Many people still eat berries, but you have to control your portioning with these. Be careful blueberries and cranberries as they add up in carbohydrates fast. Tomato-based products. Lots of people use tomato sauces and canned diced tomatoes. Make sure to read the nutrition labels – food companies are infamous for messing with serving sizes to make their foods seem “healthier.” Make sure that there are no added sugars. Condiments. It’s almost tradition to add sauce to a meal – but be careful about your favorites. Sometimes condiments and sauces can show minuscule serving sizes which skew the actual carbs that are inside. Make sure you read the nutrition and ingredient lists well. Peppers and chiles. Be very careful when you use small peppers as sometimes they can be incredibly sweet inside. There can sometimes be 3-4g carbs in a tiny chili pepper. When using bell peppers, try to opt for green as red/yellow bell peppers will have slightly more carbs. Diet soda. You can drink diet soda, but it’s recommended to cut it out completely. Some people report being knocked out of ketosis after a large consumption of artificial sweeteners. Studies also show a link between sugar cravings and artificial sweeteners – cutting the soda out will help curb your cravings. Chocolate. You can eat chocolate on keto, but you have to be very cautious with the serving sizes. You want to stick to very dark chocolate (90% or higher), as this will have much fewer carbs. Medicine. Cold medications, cough syrups, and flu remedies often contain lots of sugar. Some of the generic over the counter cough medicines contain 20g of carbs per serving, so be very careful when sick. There are usually sugar-free or diabetic alternatives. There are so many food items out there that contain hidden sugars and carbs. Always be careful about what you’re purchasing and try to make as much from scratch as you can from home. By now, you should have a pretty good idea of what to eat on a ketogenic diet. Make sure that you read and re-read through the list of acceptable foods to build a mental image around what type of meals you will want to eat. 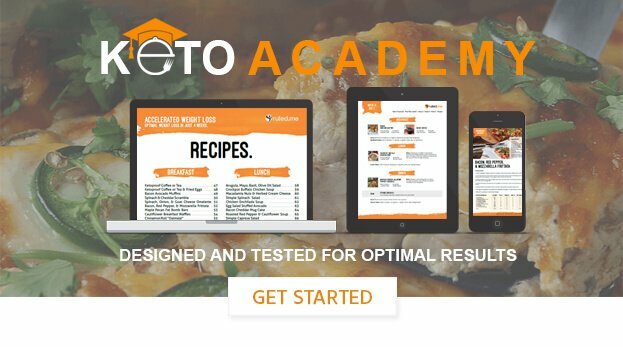 If you’re still unsure about any products or food items that might not be keto friendly, don’t worry too much. Below, you’ll find a list of things that you should always be on the look out for. In general, the more “real” the food, the better it is for you. While some processed foods are acceptable, many are not. Make sure that you read through the ingredients and nutrition information to make sure that it can fit within your diet.